Emily Byrne Curtis, "Vitreous Art: Colour Materials for Qing Dynasty Enamels", Arts of Asia, November-December 1994, p. 97, fig. 1. Hong Kong Museum of Art, Snuff Bottles of the Ch'ing Dynasty, 20 October-3 December 1978, p. 47, no. 3. Hong Kong Museum of Art, Snuff Bottles of the Ch'ing Dynasty, 20 October-3 December 1978, no. 3. This bottle comes from an extremely rare group of Kangxi "Imperial-command" snuff bottles made in the Palace workshops in Beijing. It is thought that only thirteen of these Kangxi yuzhi bottles are known worldwide. The introduction of European painted enamels on glass and metal into the Palace workshops created a radical impact on the use of enamels on porcelain throughout China. Towards the end of Emperor Kangxi's reign, the traditional Chinese palette of famille verte enamels was gradually expanded to reach its zenith. With the introduction of new enamels from Europe, colors which were previously unknown to the Chinese craftsmen became available, first to Guangzhou and Beijing, the two main centers for enameling on metal, then spreading rapidly to Jingdezhen, the great porcelain manufacturing center of China. This new palette was called famille rose because of the ruby-red derived from gold oxide, but the most significant difference from the famille verte palette was in the new technique of mixing white enamel with other colored enamels to create a wider range of pastel shades, even though the white enamel itself was not new, having been used for several centuries in cloisonné enamels. At this stage during the late Kangxi and early Yongzheng periods, enamellers in China, whether working on metal, glass or porcelain, had the widest possible range of colors at their disposal. On some earlier enameled porcelain wares the new palette was introduced gradually, resulting in the so-called "rose-verte" palette. At Beijing, where enameling only began with the new famille rose palette, the use of this combination of the traditional palette with some new colors, which is found on this example, is extremely rare and suggests that it is from the earlier phase of production, from the second decade of the century. It is also unusual that a plain white ground is used; rather than a colored ground which typically defined the output of the Kangxi Palace enameling workshops. 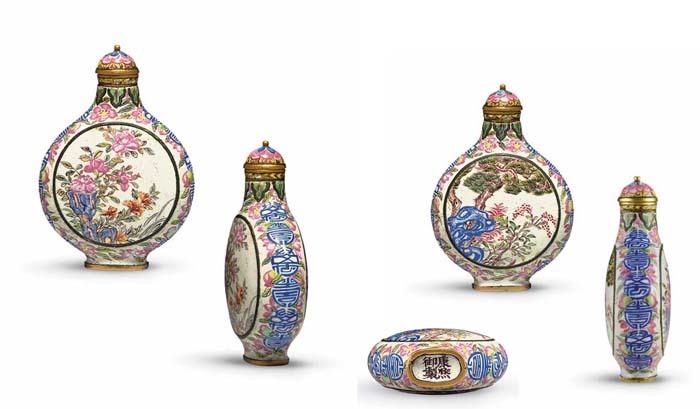 Another Kangxi-marked snuff bottle, enameled with prunus blossoms on the main panels, is in the Beijing Palace Museum, illustrated in Snuff Bottles. The Complete Collection of Treasures of the Palace Museum, pl. 127. See also one formerly from the J & J Collection and now in the Denis Low collection, sold in these rooms, 30 March 2005, lot 21. Other examples of Kangxi yuzhi-marked bottles include one in the Bloch collection, illustrated by R. Kleiner, Chinese Snuff Bottles from the Mary and George Bloch Collection, p. 2, no. 1; and another with bats, peaches and butterflies in the Reitberg Museum, illustrated by Robert Hall, Chinese Snuff Bottles, Masterpieces from the Reitberg Museum, Zurich, p. 14, no. 1. Others are in the Beijing Palace Museum, illustrated in Snuff Bottles. The Complete Collection of Treasures of the Palace Museum, pl. 128 and another illustrated in Snuff Bottles in the Collection of the National Palace Museum, p. 80, no. 3. There are a number of features that suggest that this bottle hails from the earlier part of the Kangxi period. Firstly, the painting is less stylized than other examples, including the one in the Bloch Collection, and the one in the Palace Museum, which have stylized blossoms. Even when compared to the example from the Reitberg Museum, the latter, with its stylized butterflies within a circular panel, seems to be a later development. The extremely rare reddish-brown reign mark also suggests an early work, before blue marks became standard. Finally, there is the unusual metal surround around the main circular panels and beneath the upper neckrim, which seems to suggest an early experimental form, before enameled metal bottles were standardized with continuous enamel surfaces. The panels are decorated with nandina, cockscomb and pine, all alluding to longevity. The nandina, with its red berries and evergreen leaves, is a welcome sight in winter and is also known as "heavenly bamboo", and is sometimes a visual substitute for bamboo. A combination of lingzhi, narcissus, nandina and rock form the phrase zhixian zhushou ("The fungus fairy offers birthday greetings"). In addition, the word for cockscomb (guan) is a pun on the word for "official", while the pines and rocks represent longevity. The blooming China rose enjoys a long flowering period and thus is a further symbol for longevity. Its Chinese name is also changchun ("everlasting spring"). The peaches and wanshou characters on the narrow sides of the bottle further reinforce the idea. It is very likely that this bottle was commissioned as an Imperial birthday tribute. Of the thirteen surviving bottles bearing this mark, this is the only one with its original, matching enamel stopper.